For all that Satyagraha is considered one of Philip Glass’s finest achievements, it is still a work more spoken of and written about than actually heard. Glass’s second opera, an abstract portrait of Mohandas K. Gandhi’s early years as a lawyer in South Africa, was a turning point: Previously, the composer had written almost exclusively for his own idiosyncratic ensemble. Here he adapted his style to the demands of a conventional orchestra and operatic voices, resulting in what is still among his most rapturously beautiful creations. For this new production, introduced last year at the English National Opera, director Phelim McDermott and designer Julian Crouch fashioned scenes as enigmatic and transcendent as Glass’s music. Portions of Constance DeJong’s libretto, adapted from the Bhagavad Gita, are projected onto a curved wall of corrugated iron that frames the action. Ordinary materials such as newspaper and packing tape are transformed into props, scenery and animated creatures, gracefully manipulated by stilt-walkers and aerialists. 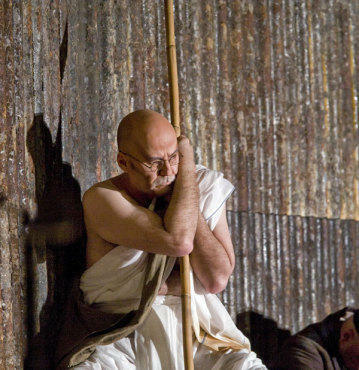 As Gandhi, tenor Richard Croft delivers a performance of spellbinding focus and heartbreaking lyricism, supported by a solid cast and Donald Palumbo’s increasingly marvelous chorus. Conductor Dante Anzolini keeps things bubbling at a sensible pace. The final scene, in which Croft repeats a simple ascending pattern backed by a radiant sky, is but one arresting highlight in the most achingly beautiful presentation the Met has introduced since Anthony Minghella’s Madama Butterfly in 2006. Metropolitan Opera House. Music by Philip Glass. Libretto by Constance DeJong. Dir. Phelim McDermott. Cond. Dante Anzolini. 3hrs 30mins. Two intermissions.